The same methods described in this guide should also work on other D series and X series RX, such as the D8R-II Plus and X8R. Why flash Frsky receiver firmware? Why do we need to flash receiver firmware? Firstly, updating firmware to keep your Frsky RX up to date with bug fixes and improvements. But beware that new firmware can sometimes introduce new bugs that break existing features unexpectedly. Therefore we don’t recommend messing with new firmware if everything is already working for you, unless you know what you are doing. Note that your transmitter’s internal RF module firmware is not the same as your Taranis firmware. 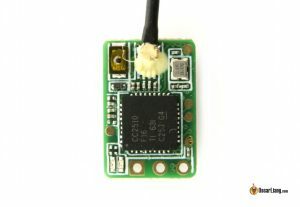 The RF module is an internal device that sits inside of your Taranis. Think of it as your Taranis is in charged of the interface, while the RF module talks with your RX and they are running 2 separate firmware. For example, flashing firmware on your Taranis, will not affect your RF module, and vice versa. Differences between EU and Non-EU firmware? 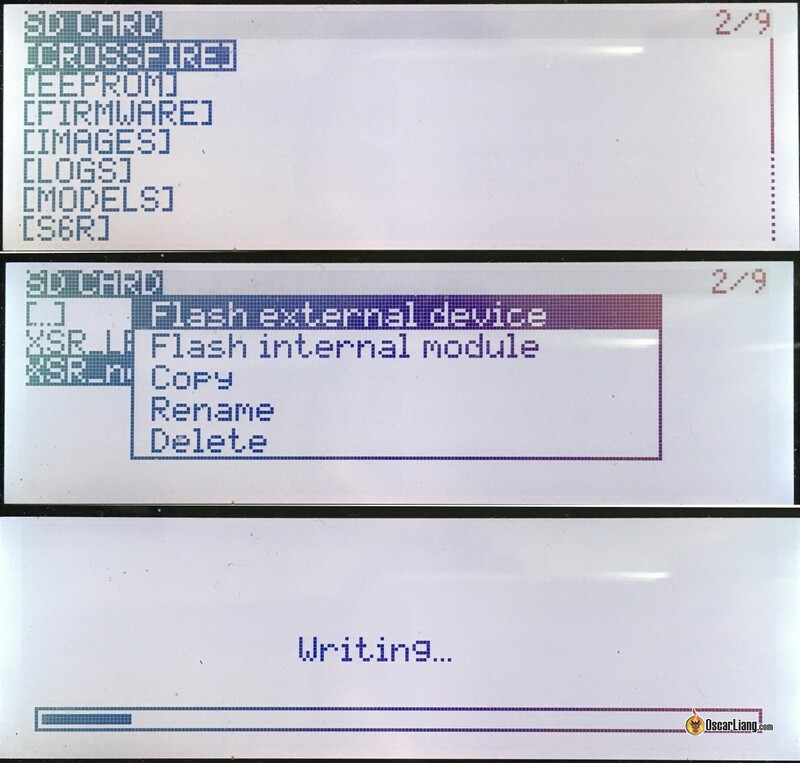 All you need to know is that EU firmware won’t work with non-EU firmware, so if you are having problem binding RX to TX, it’s likely that your RX has the wrong firmware and need flashing. If you got your TX or RX from Chinese vendors like Banggood, Gearbest or Aliexpress, they will most likely come with international firmware. If you are not sure, here is how to check what firmware you have on your Taranis. We can flash firmware on these RX through the SmartPort telemetry port since it is a bi-directional serial port (aka half-duplex). You can even use your Taranis as a programming tool to update the firmware on that. Fortunately, the D Series RX do have a normal serial port (TX and RX), so you can wire it directly to an USB FTDI adapter. 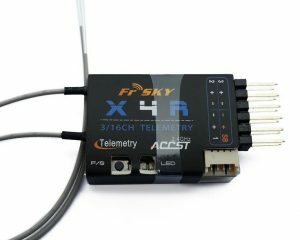 This should work on any X-Series FrSky receiver (with an X at the beginning of the name, such as XSR and X8R), but this guide is focused on the X4R-SB. Flashing the new R-XSR is exactly the same as XSR. First of all, download the firmware you want from Frsky’s website. The folder should contain both the Non-EU and LBT(EU) .frk files. To start you are going to need to put your Taranis into bootloader mode. To do this, make sure your TX is swtiched off first, then press both of the lower trims (rudder and aileron) toward the inside of the transmitter. While holding those two trims, now switch on the TX and it will turn into bootloader mode. 3. 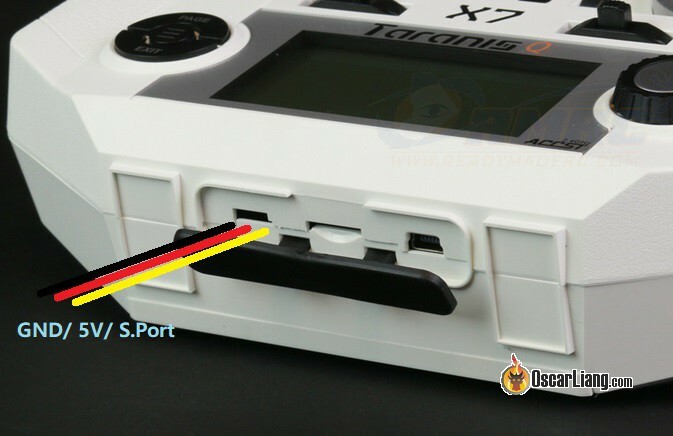 Now that you are in bootloader mode you need to connect your Taranis radio to your PC using the mini USB cable which connects into the back of your Taranis radio. If you get a pop up window saying “installing device drivers”, it is probably your first time connecting your Taranis to the computer under bootloader mode. The driver installation should happen automatically, so wait until the little dialog box disappears or states that the drivers were successfully installed. Check if you have “FIRMWARES” folder in there, if not, create it. This is where we are going to drop our receiver firmware files. Extract and copy the .frk files in your “FIRMWARES” folder. After that, unmount the drives (safely eject) and then unplug the USB cable. Now turn off your Taranis. 4. While your radio is off connect the receiver to the pins located inside the Taranis’s external TX bay. You can use female to female jumpers to plug into the Taranis pins. Most Frsky RX’s has an input voltage of 3.5V to 10V, so make sure you don’t damage your RX by powering it with voltage above 10V. If your Taranis is powered by 3S battery (11.1V), you could fry your RX if it’s only rated for 10V max. In this case you might want to power your RX separately, e.g. by a 5V source or 2S LiPo. Make sure your servo cable has the correct wire order! The cable that comes with most Frsky receivers are in the wrong order, please check. Otherwise you can burn your receiver. 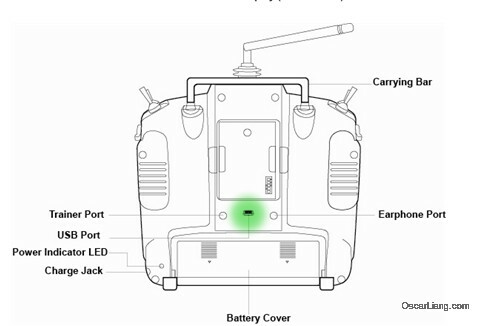 For those with a Taranis QX7, you need to use the “Smart Port” on the bottom of the radio, on the left of the SD Card slot. The pinout is different too, correct pin order is GND, +5V, S.Port going from left to right (SIG pin being closest to the SD Card slot). You can simply plug a servo cable into it. 5. Now Turn your radio back on as normal (make sure USB cable is not plugged in, and without pressing the trim buttons this time), hold down the Menu button for about 2 seconds, and scroll to a page that says “SD Card”. Scroll down to the folder where you placed the firmware files, select the file, and hold down the Enter button. MAC sometimes generates an additional file next to your firmware file, which has the “_” (underscore) before the filename. For example, if the firmware file was called “abc.frk”, you might see “_abc.frk” in the same directory. DO NOT select the one with undersocre e.g. “_abc.frk”, this will brick your RX. Instead only select the .frk file without the underscore symbol. You should see the option “Flash external device”, select that, and the flashing process will begin. The receiver will be powered on, and start flashing. You will also see “Writing…” on the Taranis screen and it should finish within 2 mins. 6. When it’s done, your receiver will powered off, and you are okay to disconnect the wires, and you can now bind the RX with your TX. Very similar to how we do it with the X series receivers above. 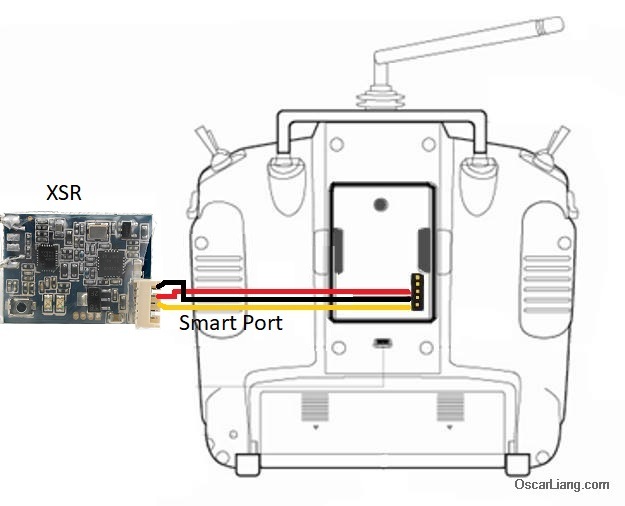 You can flash it with the Taranis, but instead of connecting the “Antenna” Pin on the Taranis to Smart Port on the RX, you can connect it to the “SBUS” pin on the XM or XM+ receivers. The rest of the procedures are the same. 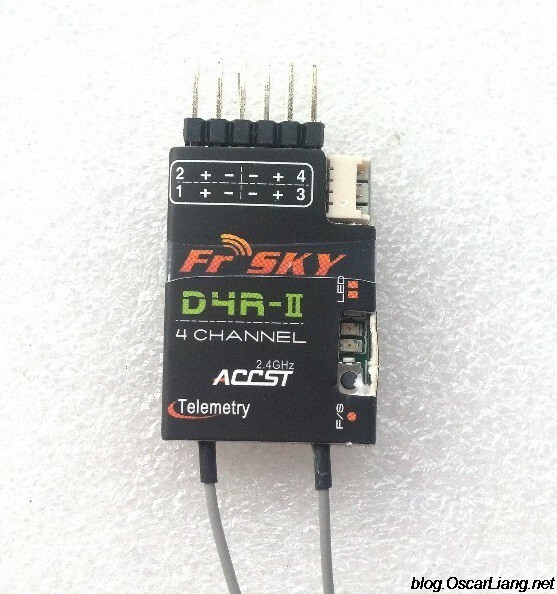 First of all, download the desired firmware from Frsky-rc.com and make sure you get the correct firmware for the receiver you are flashing. Short channel 1 pin and channel 2 pin. This will force the receiver into bootloader mode when it powers up. Connect power to your receiver. I like to use an ESC or BEC coming off from a lipo. After the download completes extract the zip file to a folder on your PC, run the exe file provided with the firmware. 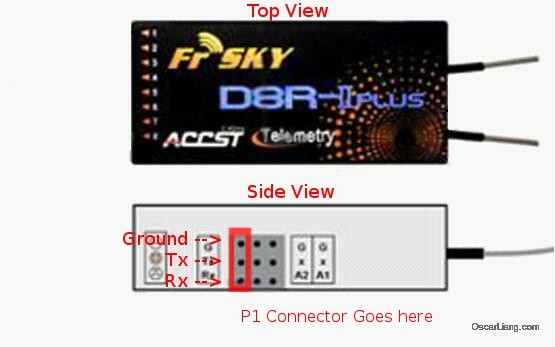 Connection is between the D4R-II RX and FTDI is fairly straight forward. Then plug your receiver into serial or USB, wait a few seconds for the PC to recognize it. You should see a new COM port appearing, if nothing appeared you might have to close the frsky Update program and reopen it. After selecting the new COM port, which is our RX, now select the .frk file that came in the firmware package, it should be the only one. Click to download. When the program finishes and goes to 100% you should now have an updated receiver! Your D4R-II RX is now updated. I just measured the xjt pins on my x9d se, and the upper pin is vbat, ground is second from bottom. No 5v output on others, so don’t know what to think about the differences in your schematics. Vbat was 7.6 volt (original battery). Also, you mentioned 5v and 2s lipo in one instruction, be careful about that, because with 2s your vbat will be 8.4 volt. When I say 5V, i mean the V+ pin on the receiver. They normally take 5V from the flight controller, but they can actually take 2S battery as well, so feeding it the voltage from your 2S transmitter battery is fine. In the latest OpenTX version 2.2.2 you can see in the flash menu a new position “Flash SPort”. Some guys say, you have to use this now, when you flash an R-XSR receiver with a Taranis Q X7 using the front socket, instead of “Flash ext. modul”. Using my QX7S I could only flash my XM+ with the ‘Flash SPort’ function. Flash ext module did not work for me. I bought a betafpv v1.0 f4 brushless fc with frsky rx. How i can flash the global spi frsky rx to EU lbt? that’s something you have to ask the manufacturer unfortunately i don’t know this FC. Hello, can anybody help me please? I am very newbie in the hobby, and I need to flash Frsky XM+ on my Hawk 5 to enable OSD RSSI, but I don’t have Taranis, I have Jumper T12. 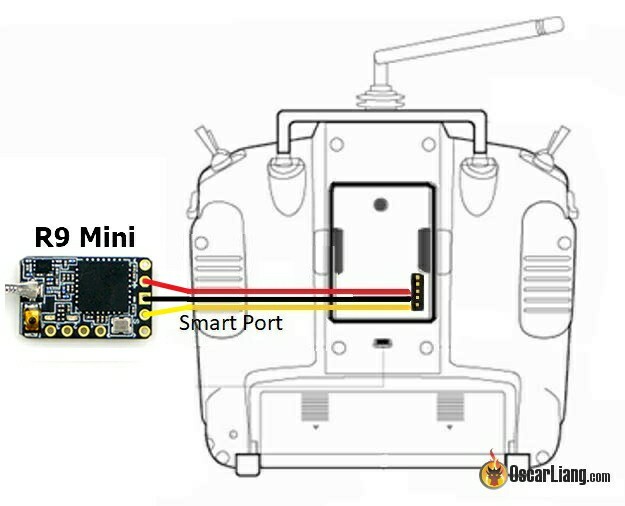 I have tried this: https://oscarliang.com/flash-frsky-rx-fc-passthrough/ but have some trouble, since I have F4 board and some guy in FB group told me, that it will be some problem with smart port and I should try to flash it thrue JR( or RJ). Can abydoy point me to the easiest way how flash it for newbie on the Emax M4 magnum AIO with Jumper T12 please? You can easily flash your receiver via Jumper’s external port connector, just like in Taranis (because T12 is technically clone of Q7). Just select firmware file, then “Flash external device”. I’ve just flashed R9MM with flex fw via external port in T12 with official JumperTX 2.2.3 firmware. Interesting thing: I’ve initially swaped VCC with GND, thankfully nothing has burned. Thanks to you for a very helpful article. I am unable to find any information on flashing my receivers using my HOURS X10S with opentx. Can the x10s flash receivers. Tehre is an sport. I cant seem to make it work . There does not seem to be voltage applied to the sport when i select firmware and then flash sport. Anyone tried flashing the G8RX receiver a newish receiver that has the built in vario. Can’t get it to bind as the receiver is EU LBT and the Tranmitter is FCC. Firmware. Want to keep the transmitter FCC as works with all my other receivers. Very little info about it or videos explains how to flash it. The Frsky website has the two different Firmwares for it. Have tried many different ways with Frsky update adapters, nothing. No idea what pins should connect to what in the back of the transmitter. Lots of good info from Oscar on other receivers here but nothing on the G8RX. Look forward to any advice. Trying to flash my rxsr via sport on x7 but get no error or flash it just goes back to the list of files! Tried first on 2.2 and now on 2.2.2 which actually has internal device external device and sport options . Reciever bound ok and will briefly flash the led but nothing more when trying to update it. Since i’ve lost many hours of troubleshooting, just wanted to say that I’ve not been able to flash the module with external power supply (in my case a 5v ftdi adapter). Once I bought a 2s lipo and connected to Taranis, flashing was successful at first attempt. I’ve asked on forums, and I’ve been told this is due to a timing issue (module has to be turned on right before flash starting). To make sure: I have a Tanaris QX7 and a X4R-SB receiver with supplied smart port cable. 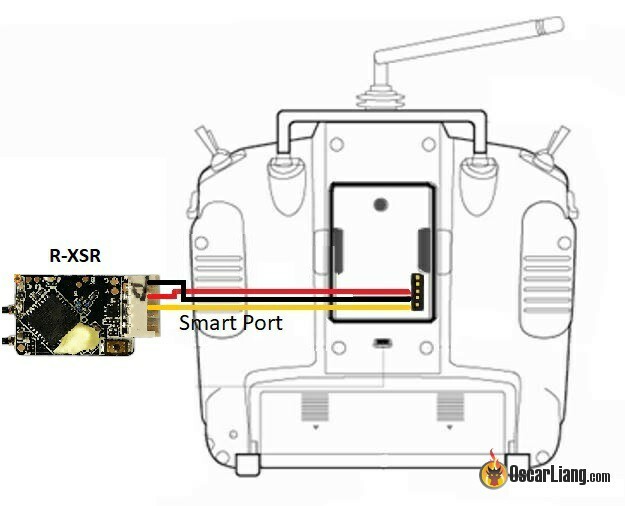 With that I do not have to cross wire the cable in order to flash the Rx, when using the smart port socket at the bottom of the Tx? I have a original X9D Taranis (NOT PLUS) I have updated the firmware and bootloader to the latest 2.2.1. I have an R-XSR receiver on the latest firmware from the frsky website. I can’t get the receiver to bind with the Taranis. I have successfully managed to bind the same receiver with a new Taranis SE with an older 2.2.0 firmware. I have ensured that both TX ad RX are on EU (LBT) firmware and I know the RX is working fine, just not with the OLD taranis radio. Kindly please assist. I have taranis X9D (non-eu X9D016932B01). I have firmware version opentx-taranis-2.0.20 on my radio. 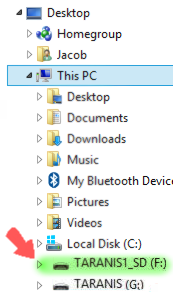 I have downloaded and saved a upgrade for X8R receiver but ony get the “delete” option when trying to flash to the rx – no sub menu with options to flash to external device etc.? At last – updated my bootloader and now I get the complete flash menu – phew! Is there any other way to update xm plus after it already connected to the flight controller so it doesn’t have to be unsoldered and soldered again? They are so small and all that heat could damage those little boards! Mine is on old firmware and will not do telemetry in channel 16 so I figured it has the old firmware. I am in the same situation. I am wondering if I can solder a pigtail to the the other side of the receiver for flashing – while leaving the wiring to the flight controller (BFF3) intact. Is there any risk of power from the Taranis affecting the FC? Great help ! Thanks brother!! For those using a QX7 on 3S power, I can confirm that the voltage supplied to the S.Port is 5V. I had was initially concerned that the full pack voltage may have been applied to the S.Port. However, a test measurement and an actual receiver flash proved this not to be the case. Thanks mate – very useful. Really good tutorial, if only I had noticed the warning about Mac OS!! So now I have bricked my X4R SB, can it be recovered or do I have to renew it? I don’t think you can, at least I haven’t found a fix for this myself. Really need to put that warning BEFORE the part about flashing the firmware. Killed my R-XSR for the same reason as above. I just got a micro quadcopter running Omnibus F4 Nano with Frsky XM+ receiver directly soldered. Currently the receiver does not seem to send RSSI on channel 16 so I am looking at updating the firmware on the receiver to enable this. My question is can I flash the firmware on the XM+ using a Taranis while it is still connected to an unpowered flight controller as I don’t want to desolder the receiver if it can be avoided? same question …my x4r is soldered to the flight controller …do i need to desolder it ? I thought about this as well, however I decided against this and dismantled my components as voltage will be supplied 7/11v+ from the controller I didn’t want to back feed any components and smoke anything. As this was a small Whoop Acro build it didn’t take me long. Worked really well tho. Good luck! Is this the same mod/inversion we did to use Crossfire? Hi Oscar!, I’m having hard time updating my XSR rx (wanna use LUA) , my Taranis X7 does have a S-port on the bottom, but when y tried to flash the RX alway got a messagge “FW update error bottom pin no resp”. Did you find a solution to this problem, I have the exact same problem trying to update a XM Plus Rx from International to EU-LBT firmware. Hope you found a solution you can share, since I’m really frustrated looking for answers but with no luck. I just tried this with my R-XSR and It started to flash from my X9D Plis. About halfway through the flash I got got white smoke and now it’s dead. Is there anything I can do. I checked everything. Connections were all correct. I’m using the stock battery (this RX is rated to upto 10 Volts). In part 5, you may want to remind users to normal start their Taranis, or unplug the USB connection to PC as the bootloader option isn’t used at this point. that’s a good point, I added a reminder now. I need some help.. after flashing two of my xsr.. now i cannot bind them to my taranis q x7.. 2 lights are on, no flash.. I dont know what to do next.. and i try to reflash them.. but my x7 having an error.. when trying to flash..
How do you flash without Taranis if you use a radio with XJT module? PLEASE ADD TO YOUR TUTORIAL: Taranis must NOT be powered with more than 2S as this voltage is passed to the RX!!! thanks for the warning man, sorry for you loss, I would’ve never realize it’s a problem as I am using stock battery. Why is it advised to power the receiver using VBAT when right next to it is a 6 volt source? This did not work for me. When I use the smartport on the X7 nothing the xsr does not power up and when I try to flash it says error finding pins. I strongly recommend getting hold of Frsky supports and see if it’s just a faulty unit. My 50ct for binding QX7 to XSR (as it’s can be a pain in the a**). I’ve recently bought a non-US QX7 (2017/06), and an EU XSR. – XSR_LBT_build151118.frk (flashed on XSR) *FIRST* *THEN* XSRLBT170619.frk (which binds). Hi there, just wanted to thank you for the article. Managed to flash an xm+ from a Taranis QX7 (smart port near SDcard, +5V in the middle). It nows sends RSSI value on Channel 16 (AUX12 in BetaFlight), so I have RSSI on OSD with this non-telemetry receiver. Excellent, thanks for letting me know! Hi i’m Luca and i live in EU. I have taranis plus and recently i bought 2 receivers from china. So.. these two receivers have the firmware NO EU. How can i do to flashing X4R with Eu firmware? Because not bind! Hi Oscar, thank you for your great explanations, as usual. 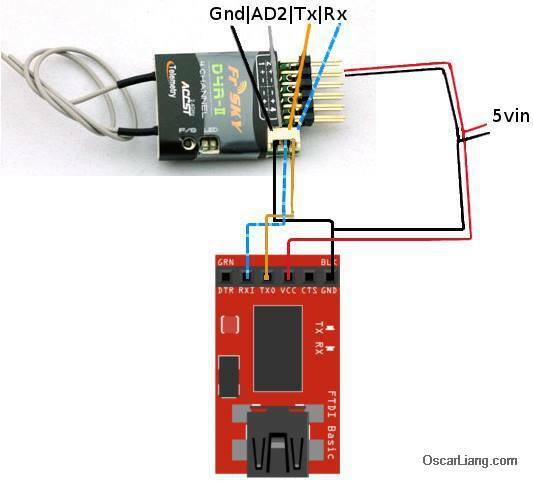 if you want to use usb-to-serial adapter (ftdi chip), you need to invert rs232 signals (for both rx and tx). It can’t work without this inversion. And don’t forget to cancel inversion by flashing again. I think you need to check the last breadboard schematic at the end of the article. I am pretty sure the 5v and gnd wires from breadboard power rail that go down to the centre of the breadboard are reversed! Noticed it, and it is now fixed, thanks for the comment. I wonder LBT firmware means for EU or it’s something else? Yeah, LBT stands for Listen-Before-Talk which is the main difference between firmwares. It was done this way to be in compliance with EU laws.